The National Police Commission (NAPOLCOM) has released today, July 7, 2015 the complete list of passers for April 2015 Senior Police Officer Promotional Exam. The complete list of passers is now available online. 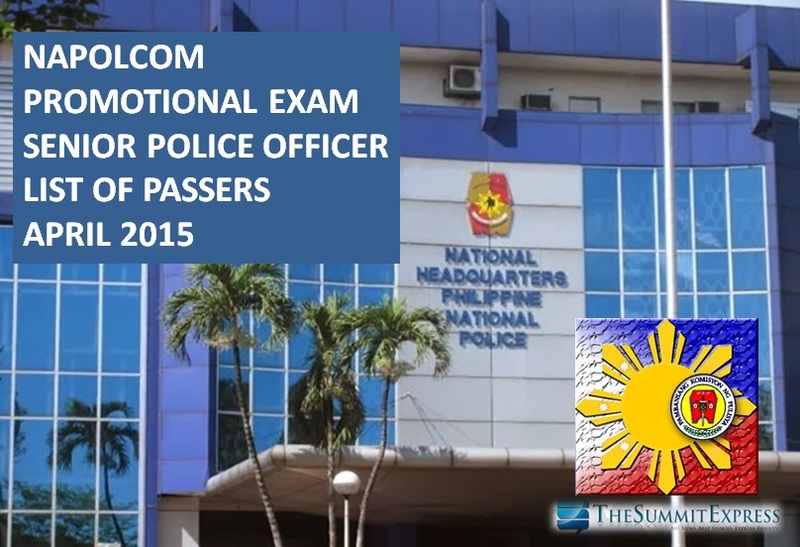 NAPOLCOM said that a total of 4,253 examinees passed the Senior Police Officer exam. NAPOLCOM Vice-Chairman and Executive Officer Eduardo U. Escueta said that 22,340 took the various promotional test categories. NAPOLCOM administered the PNP entrance examinations on Sunday, April 26, 2015 to a total of 35,674 examinees including the PNP entrance exam takers in designated testing centers nationwide. The April 2015 NAPOLCOM exam covered the qualifying tests for Police Officer I and the promotional examinations for Police Officers 2 and 3; Senior Police Officer (for SPO1 to SPO4); Police Inspector (for Inspector and Senior Inspector); and Police Superintendent (for Chief Inspector and Superintendent).